Situated in a quiet street very close to the main street of Roccaraso, the family-run Hotel Trieste has been welcoming guests for more than 50 years. The shops, bars and restaurants of Roccaraso are a short way away and for guest convenience there is a hotel shuttle to the ski lifts and amenities at Roccaraso’s Aremogna base area. The family run Hotel Trieste has been a landmark in the heart of Roccaraso for more than fifty years, and has been completely renovated in the recent past. The lively main street of Roccaraso is just 200 m away but the Hotel is situated in a quiet street opposite a park. 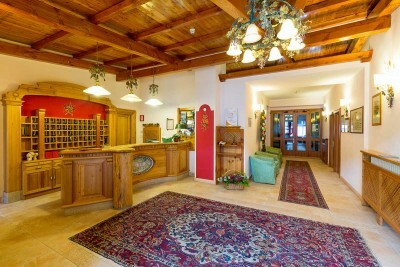 The hotel’s design is Alpine with the generous use of wood creating a warm ambience. 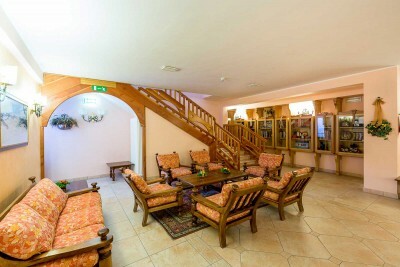 The spacious reception area leads to the adjacent guest bar and the bright dining room where all meals are taken. The 50 guest rooms, which can sleep up to four people, are served by a lift located close to reception. Other facilities include free wifi throughout the hotel, ski deposit, guest ski shuttle to the slopes at Aremogna, and regular evening ‘animazione’ entertainment in the basement taverna. There are 50 comfortable guest rooms, sleeping up to four people, with some interconnecting rooms. Each room is equipped with TV (Italian channels only), small fridge, safe and telephone. Bathrooms have either bathtub and shower or a shower closet, w.c. and hairdryer. Being in a slightly elevated position, most rooms have lovely views of the nearby mountains. The spacious, light dining restaurant is ably looked after by the friendly Trieste staff and the chef takes great pride in his cooking. Each morning an extensive buffet breakfast is laid out for guests to enjoy before skiing. Choices include croissants of many flavours including chocolate, honey and apple, cakes, fruit in syrup, various cereals, bread, yoghurt plus a selection of hot and cold drinks. 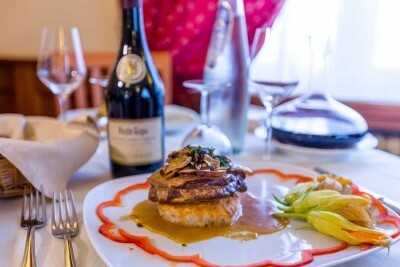 For evenng meal there is a choice of three first and second courses, including vegetarian. In addition, there are separate buffets for antipasti, vegetables and desserts. 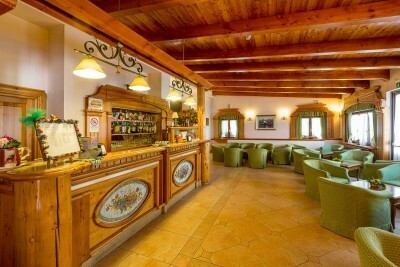 The cozy Hotel bar is a great place to relax over drinks after skiing and after the evening feast.